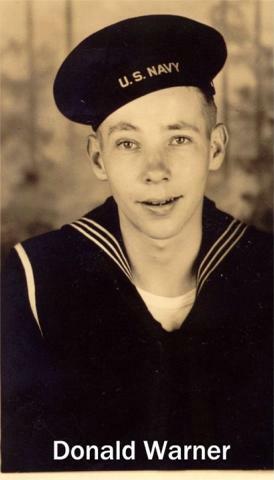 Born April 11, 1926, Purdy Mo.. Enlisted in the Navy in March 1944. After 6 weeks of boot camp at Farragut Idaho, I was assigned to the USS West Virginia which was being rebuilt at Bremerton Washington Naval Shipyards after being sunk at Pearl Harbor on Dec 7, 1941. I served aboard the Wee Vee until the end of the war and was aboard when the Wee Vee was anchored in Tokyo Bay, not too far from the USS Missouri where the Japanese formally surrendered. I participated in the "Magic Carpet" project which consisted of transporting Army personnel and POW'S from Pearl Harbor to San Diego Ca. I left the Wee Vee in Bremerton Washington as an FC3 where the Wee Vee was being decommissioned. Served aboard the Uss Power DD 839, the USS Alamo LSD 33, and Great Lakes FT School, retired from the Navy in 1968 as FTCM. Presently live in Cassville Missouri.